Admiral’s Tower Co-op rests tall atop of Admiral’s Hill in Chelsea, Massachusetts overlooking all of Boston’s glory. Admiral’s Hill once housed the Chelsea Naval Hospital and was the pride of Chelsea and our Nation’s armed forces. Upon entering Admiral’s Tower Co-op, one can feel the presence of yesteryears as the atmosphere is reminiscent of the Hill’s naval roots. From the aquatic color scheme on the walls to its tile inlays of anchors and ship’s helm, one can feel safe and secure in the hull of Admiral’s Tower Co-op. Admiral’s Tower Co-op is a 6-story, 100 unit affordable senior community designed for resident members aged 62+. In addition, there are a limited number of mobility impaired units for those that qualify over the age of 18. It is also recognized as “A Community of Quality “by the National Affordable Housing Management Association. This building was completed in 1986. 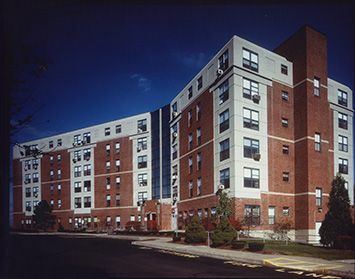 Admiral's Tower Co-op Apartments has come to be a healthier and safer environment to live in by becoming 100% smoke free. Smoking is not allowed within the individual apartments, the common areas, and within 25 feet of the building. Members in this community enjoy participating in many activities, including bingo and shopping in their own “Ship’s” store. There are events and parties which include lunches, dinners and even ice cream socials just to name a few. Admiral’s Tower Co-op is just minutes away from expressways and downtown Boston. Admiral’s Tower is convenient to grocery shopping, banks, restaurants and is on a bus line. Admiral's Tower Co-op is proud to be recognized as a NAHMA Communities of Quality Corporate Partner. This designation is for multifamily properties that have achieved a high standard of excellence in the way they are managed, the services they provide residents, the experience and training of personnel, and other criteria.